The Colorado Rockies defeated the Cincinnati Reds 8-2 Sunday afternoon at Coors Field. The Rockies lineup returned to form in Sunday’s victory vs the Reds. The eight-run performance tied the club’s highest run mark for a single game this season. Although the game ended on a good note, things did not start off well for the Rockies and starting pitcher German Marquez. Marquez recorded the first two outs of the ballgame with relative ease, but then surrendered a double to Joey Votto who later scored on an RBI double hit by Scooter Gennett to give Cincinnati an early 1-0 lead. Despite struggling early, Marquez buckled down as the game went along, logging seven innings and allowing one run on five hits while striking out six. The Reds’ lead was short-lived as the Rockies responded in the bottom half of the first inning by posting three runs of their own. David Dahl started things off by hitting a solo home run to right field. After Nolan Arendao reached base on a single, Carlos Gonzalez blasted a towering home run to the third deck of the stands in right field, establishing a 3-1 for the Rockies after one inning of play. The game remained quiet until the sixth inning when the Rockies added three runs. Tony Wolters started things off with a leadoff single and then advanced to second base on a sacrifice bunt from Marquez. Charlie Blackmon then hit an RBI single to left field to score Wolters and push the Rockies lead to 4-1. Arenado then furthered Colorado’s advantage by striking a two-run home run to center field, extending Colorado’s lead to 6-1. Ian Desmond, who has dramatically struggled this season with a sub .200 batting average, put the icing on the cake for Colorado in the seventh inning by hitting a two-run home run over the barriers in right field to make the score 8-1. 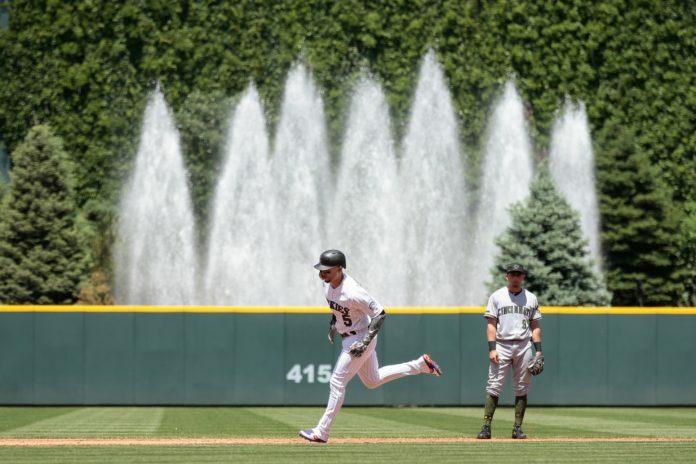 From there, a combination of Mike Dunn, Adam Ottavino, Brooks Pounders, and Wade Davis tamed the Reds in the final innings to solidify the victory for Colorado, despite Cincinnati scoring a run and loading the bases in the ninth inning. Sunday’s victory was one of the more complete offensive performances the Rockies have had this season as every starting position player recorded at least one hit throughout the afternoon. 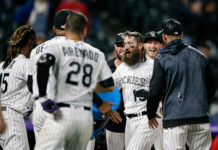 The Rockies will continue their nine-game homestand tomorrow when they welcome the NL-West rival San Francisco Giants to town for a three-game set.